UPPER EAST SIDE — Residents concerned about damage to subway tunnels and rails in the wake of Superstorm Sandy fear the MTA isn't doing enough to shore up the under-construction Second Avenue subway to defend it against future storms. Residents say they want to know if the agency is planning any changes to the blueprints for the subway — set to go online in 2016 — to compensate for dramatic weather and rising sea levels. Metropolitan Transportation Authority representatives said at a Second Avenue Subway task force meeting Tuesday that the new line's route hadn't suffered damage from Sandy, just minor construction delays. They added that they do not expect any future storm of Sandy's scope to imperil the line. The MTA also promised to provide Community Board 8 with more answers to questions raised at the meeting by Feb. 1. Bill Goodrich, program executive for the Second Avenue Subway and an MTA vice president, said planners had taken into account a 100-year flood scenario — a commonly employed metric for transit projects — and were certain the tracks and stations would be safe. He added that the MTA could still change construction plans if officials felt the need to do so. "We've got four years of construction left, and all of our strategic contracts could be modified," he said after the meeting. Much of the city's subway system was decimated by seawater pushed inland by Sandy, and the MTA has floated ideas to protect tunnels against future storms with techniques including massive inflatable balloons. Jordan Wouk, one of several residents attending the meeting on Tuesday, said the MTA should do everything possible to protect the newest addition to the transit system. "Remember what happened to the newest subway station in Manhattan?" Wouk said, referring to the South Ferry Station, which was decimated by Sandy. "The cost to reopen is estimated to be $600 million," Wouk said of the downtown station, which is still closed a month and a half after the storm. 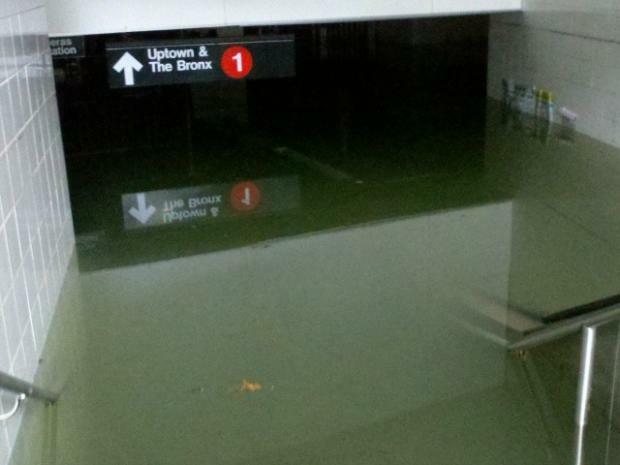 "How are the protections from flooding for the Second Avenue subway different?" All of the entrances of the Second Avenue stations were high enough not to take on water during Sandy, Goodrich said. Also, station crews would be able to install barriers to prevent inundation in the event of a storm, he said. Another resident raised concerns about power outages, asking if there were backup generators in place on the line. Goodrich answered there were not gasoline or diesel-powered generators, but that the electricity system was wired with a "redundant feed." "If Con Edison were to lose power in one feed, they can supply power from another," he said. The MTA will also install an Uninterrupted Power System, battery-powered lights that would help straphangers to evacuate stations in an emergency, Goodrich said.